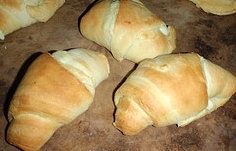 I have the best homemade crescent roll recipes from scratch that are buttery and soft. Offering several homemade bread recipes including my popular homemade fruit bread recipes. In a large bowl, dissolve yeast in warm water. Let stand until creamy, approximately 10 minutes. When yeast is ready, mix in the mashed potatoes, sugar, shortening, eggs, salt, and 3 cups flour. Stir in the remaining flour, 1/2 cup at a time, until dough has become stiff but still pliable. Turn dough out onto a lightly floured surface, and knead until smooth and elastic, about 8 minutes. At this point, you may use a dough hook on your mixer instead of hand kneading. Lightly oil a large bowl, place the dough in the bowl, and turn to coat with oil. Cover with plastic wrap and place in a warm area, letting the dough rise until doubled in size. Deflate the dough, and turn it out onto a lightly floured surface. Divide the dough in half, and form into 12 inch rounds. Brush generously with melted butter, and cut each circle into 8 wedges. Roll wedges up tightly, starting with the large end. Place on lightly greased baking sheets with the points underneath, and the ends bent to form a crescent shape. Cover, and let rise for 1 hour. Do You Want To Use A Bread Machine? I cut all the ingredients in half, put everything in the bread maker and processed on the "dough" cycle. I use one full tablespoon of yeast as per my machine manufacturer's recommendations, and I have exchanged whole wheat flour for half of the flour. So bake away.